Risotto is absolutely one of my favourite things to eat, it’s so creamy, indulgent and delicious that it’s simply impossible not to love. Eating risotto however proved rather problematic when I decided to go on a diet. The abundance of carbs and high calories in the arborio rice when teamed with lots of cream and cheese is not the way to go about losing the pounds. But I still wanted my risotto. I’ve seen a lot of recipes lately that substitute rice for things like quinoa and pearl barley, but not really looked much into it until now. 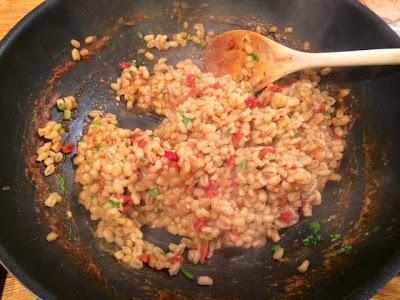 I did a little bit of research on the Sainsbury’s website, as that’s where I usually shop, and on discovering that pearl barley contains 131 calories per 100g whereas the arborio risotto rice I usually buy has 344, the pearl barley was instantly sold! 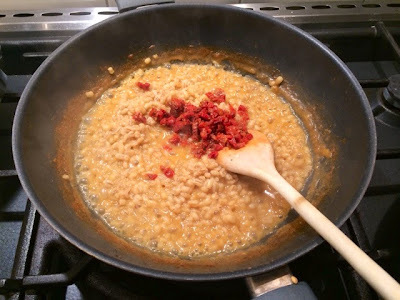 Ever since my meal at Kettner’s last month I’ve been desperate to attempt a sun dried tomato risotto. 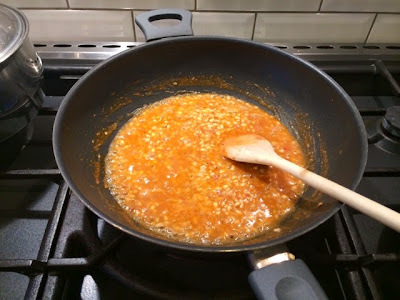 I usually opt for the creamy sauces over tomatoey ones, so my own risotto making has been somewhat limited to the bacony mushroomy kind with lashings of parmesan, I’d never considered going down the tomato route until I tried that delicious one at Kettner’s. Similarly to the dinner I had there, I teamed it with a nice simple pan fried piece of fish. In this case it was some rainbow trout that my Dad had caught that very morning and it doesn’t get much fresher than that. I did have some sea bass on back up though in case he didn’t catch anything, which I think would have gone with it just as well. Simply steamed broccoli added the veggie element to this dish. This isn’t really the kind of dish I’m used to cooking at home but sometimes it’s really nice to step out of your comfort zone and try something different, because when you come across something as tasty as this it’s well worth the effort. I’m definitely going to try this one out on other friends and family and I think it’d make a fantastic and unusual dinner party dish. 1. 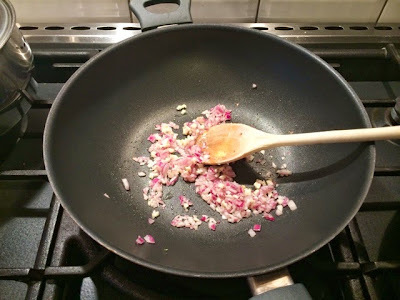 In a large pan heat about 1/2 tbsp oil and gently fry the onions on a low to medium heat with the garlic until the onions have softened a bit and started to turn translucent. 2. 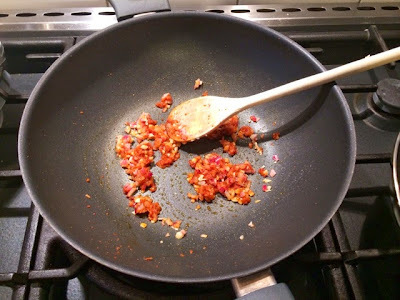 Stir in the sun dried tomato purée, coating the onions and garlic and cook for about a further 2 minutes. 3. 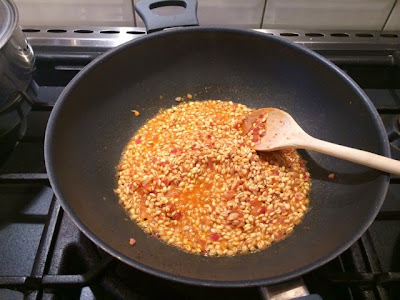 Add the pearl barley and stir through until all the grains are coated with the tomato, onion and garlic mixture. 4. Pour in just enough stock to cover the pearl barley and continue to stir until nealry all of the liquid has been absorbed. 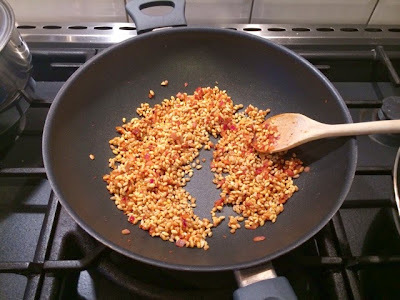 Add more liquid and continue to do so until the pearl barley is cooked. When you have used up the stock just use water. 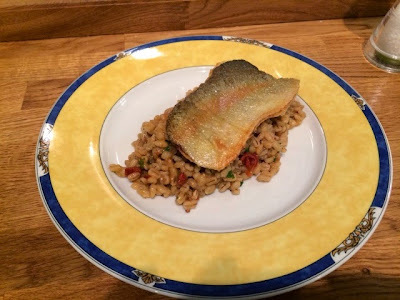 This took me about 45 minutes in total, which is a little longer than it ordinarily would with risotto rice and I therefore served up dinner a little late but thats what experimenting and trying new ingredients is all about. The best way to tell if it’s cooked is to try a bit. 5. 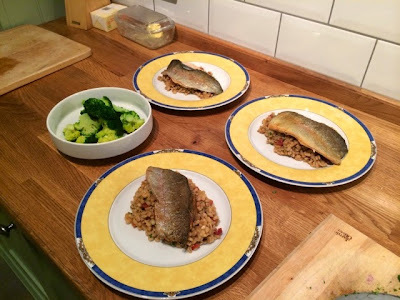 When the pearl barley is nearly cooked put your broccoli on to steam and cook your fish. Season the fillets with a little salt and pepper and heat a little oil in a frying pan on a high heat. Place your fillets into the pan skin side down, hold the fillet down pushing the skin onto the surface of the pan for a few seconds to ensure the skin cooks flat and doesn’t curl up. Cook for 3-5 minutes or until nearly cooked through (you’ll be able to see the colour of the flesh changing and only the top should still be a tiny bit raw looking, flip the fillets over to finish of the top for a further minute or two. 6. Stir the chopped sun dried tomatoes into the risotto while the fish and broccoli are cooking and season well with salt and pepper. 7. When everything is just about done stir the fresh basil into the risotto and you’re ready to plate up. 8. 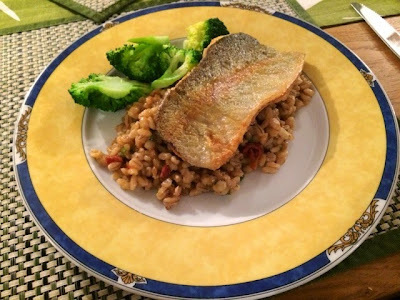 Divide the risotto between the plate and top with a fillet of fish each with the steamed broccoli on the side for everyone to help themselves to.